In April 2018, sophomore English classes were given the opportunity to read a graphic memoir for the first time in FVHS history. “Persepolis” written and illustrated by Marjane Satrapi, gives readers her personal insight to the Iranian Revolution of 1979 and the years that followed. However, the novel soon faced backlash from students who claimed that Satrapi wrongfully portrays Islam as an extremist religion that oppresses Iranian citizens. 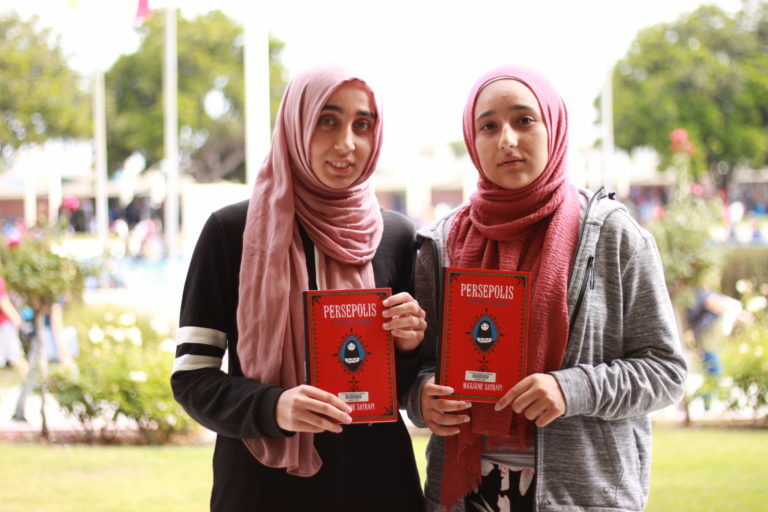 On May 1, 2018, then-sophomores Yara Mansour and Haneen Bany-Mohammed created a petition on change.org to request the removal of “Persepolis” from the Huntington Beach Union High School District (HBUHSD) curriculum. “Satrapi constantly paints Islam as the oppressor, when in reality all those cruel things were from Iran itself,” Mansour wrote on their petition. During the 1979 Revolution, extremist religious leader Ayatollah Khomeini rose to power and overthrew the 2,500 year old Pahlavi dynasty. After his hostile takeover of Iran, Khomeini passed many extreme laws including the execution of all rebels and the forcing of women to wear the veil. In her memoir, Satrapi depicts two sides of the revolution: those who are in favor of the veil and those who are opposed to it. Early on, Satrapi takes the stance of how the veil became a symbol of oppression Iran. Within a couple of days, the petition received 500 signatures from students at FVHS and community members. To date the petition has been signed by 1,024 people. “It all started when my classmates asked if I was oppressed for wearing the headscarf,” said junior Amirah Salem said. People began to ask her if she would get beat up if she showed her hair. Not long after, a friend of hers had her scarf pulled down by a classmate. “I do not want my school to be a part of supporting any of the biased stereotypes Muslims are known for, let alone make [them] a part of the curriculum,” said Bany-Mohammed. Another issue that Mansour and Bany-Mohammed railed against was Satrapi’s tendency to use the words “fundamentalism” and “extremism” interchangeably. Fundamentalism is the strict adherence to and literal interpretation of any religious scripture; it is practiced by many Muslims and Christians around the world today. Extremism, on the other hand, describes any radical religious or political views or practices which often lead to violence, as in the case of Khomeini’s rule as a theocrat. On Aug. 14, 2018 Mansour, Bany-Mohammed and Salem appeared before a panel of HBUHSD board members in a meeting at the Huntington Beach Union High School District Office to request the removal of Persepolis from the curriculum. “I want to emphasize that we are not accusing anyone — all of our teachers have done a wonderful job presenting this book, but the book has a lot of room for assumptions that would be better off removed from the curriculum,” said Salem. Shortly after the board meeting, Mansour, Bany-Mohammed and Salem met with District Superintendent Clint Harwick and Assistant Superintendent Owen Crosby to discuss the next steps. The board decided to keep the novel as a part of the curriculum, but assured the students supplementary materials will be taught by teachers. “We believe that, in order to combat dehumanizing stereotypes, different perspectives need to be heard,” said Bany-Mohammed. Baron Banner has asked for the English department’s perspective. Amy Hollingsworth, head of the English department directed us to Jennifer Lamperts, the district’s English facilitator and as of press time, we have not received any comments from Lamperts.